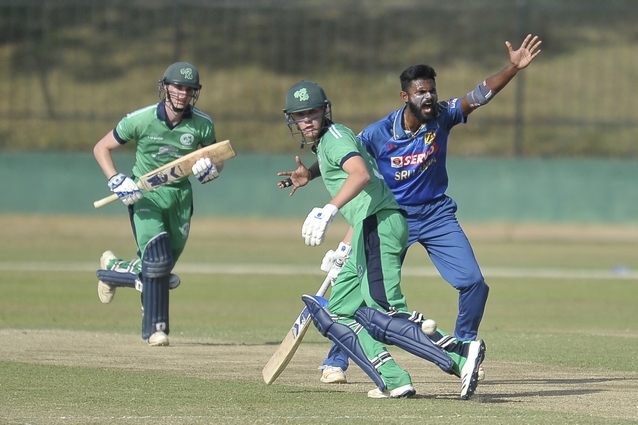 HAMBANTOTA – More than 650 runs were scored, including three batters reaching centuries, as the Ireland Wolves fall 60-runs short against Sri Lanka A in the first 50-over match of a five-match series at the Mahinda Rajapaksa International Cricket Stadium in Sri Lanka. After winning the toss, Ireland Wolves captain Harry Tector sent Sri Lanka A into bat first, however right from the first over the home side looked to attack the Wolves bowlers as they mounted a total of 365-5 from their 50 overs. Two Sri Lankan batters passed three-figures with Avishka Fernando hitting 128 runs from 120 balls, and Milinda Siriwardana scoring a whirlwind 111 from 75 balls. While the bowlers struggled to contain the scoring rate, Stuart Thompson’s 2-36 from 6 overs was the pick of the line-up, and – while going wicketless – 18-year old leg-spinner JJ Garth maintained a consistent line and conceded just 54 runs from his ten overs. With a mountainous target of 366 runs for victory ahead of them, the Wolves batters did not shy away from the task. The visitors put on a commendable batting display as they kept themselves in the game – with the target an unlikely possibility, but still within touching distance if they could put together solid partnerships. James Shannon returned to form with a well-compiled 67 from 67 balls, that featured six fours and a six. However, the mainstay of the innings was 22-year old wicketkeeper-batsman Lorcan Tucker. Tucker hit 109 from 86 balls, striking 13 boundaries and clearing the ropes three times. Tucker has now scored 290 runs on the tour to date, at an average of 58. This was also his second century in Wolves colours, after his 138 against Gloucestershire 2nd XI in September last year. By the time Tucker fell in the 36th over, the Wolves needed around 9.5 runs an over for the last 14 overs and managed to push their score to 305 before being bowled out – Shane Getkate’s 37 from 31 balls giving the batting side a late-order boost.